1 C 40/9 EUROPEAN CTRAL BANK OPINION OF THE EUROPEAN CTRAL BANK of 4 February 2005 at the request of the Council of the European Union on a proposal for a directive of the European Parliament and of the Council on the prevention of the use of the financial system for the purpose of money laundering, including terrorist financing (COM(2004) 448 final) (CON/2005/2) (2005/C 40/06) 1. 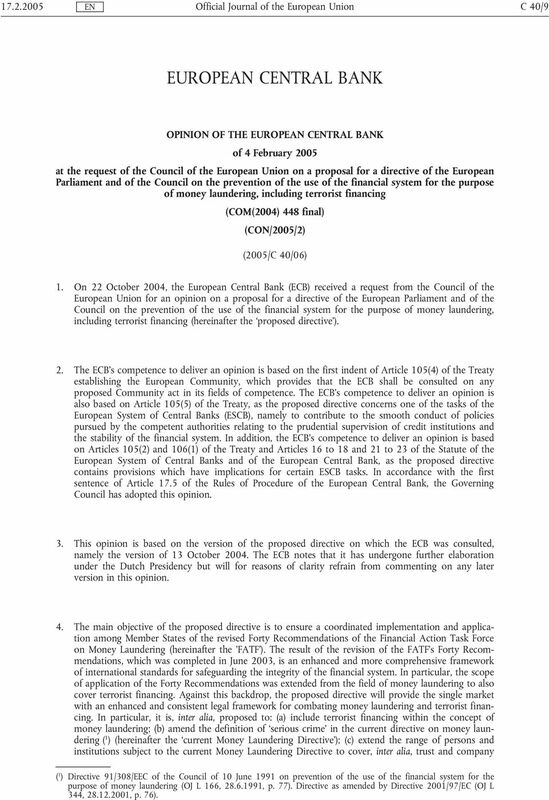 On 22 October 2004, the European Central Bank (ECB) received a request from the Council of the European Union for an opinion on a proposal for a directive of the European Parliament and of the Council on the prevention of the use of the financial system for the purpose of money laundering, including terrorist financing (hereinafter the proposed directive ). 2. The ECB's competence to deliver an opinion is based on the first indent of Article 105(4) of the Treaty establishing the European Community, which provides that the ECB shall be consulted on any proposed Community act in its fields of competence. The ECB's competence to deliver an opinion is also based on Article 105(5) of the Treaty, as the proposed directive concerns one of the tasks of the European System of Central Banks (ESCB), namely to contribute to the smooth conduct of policies pursued by the competent authorities relating to the prudential supervision of credit institutions and the stability of the financial system. In addition, the ECB's competence to deliver an opinion is based on Articles 105(2) and 106(1) of the Treaty and Articles 16 to 18 and 21 to 23 of the Statute of the European System of Central Banks and of the European Central Bank, as the proposed directive contains provisions which have implications for certain ESCB tasks. In accordance with the first sentence of Article 17.5 of the Rules of Procedure of the European Central Bank, the Governing Council has adopted this opinion. 3. This opinion is based on the version of the proposed directive on which the ECB was consulted, namely the version of 13 October The ECB notes that it has undergone further elaboration under the Dutch Presidency but will for reasons of clarity refrain from commenting on any later version in this opinion. 4. The main objective of the proposed directive is to ensure a coordinated implementation and application among Member States of the revised Forty Recommendations of the Financial Action Task Force on Money Laundering (hereinafter the 'FATF'). The result of the revision of the FATF's Forty Recommendations, which was completed in June 2003, is an enhanced and more comprehensive framework of international standards for safeguarding the integrity of the financial system. In particular, the scope of application of the Forty Recommendations was extended from the field of money laundering to also cover terrorist financing. Against this backdrop, the proposed directive will provide the single market with an enhanced and consistent legal framework for combating money laundering and terrorist financing. 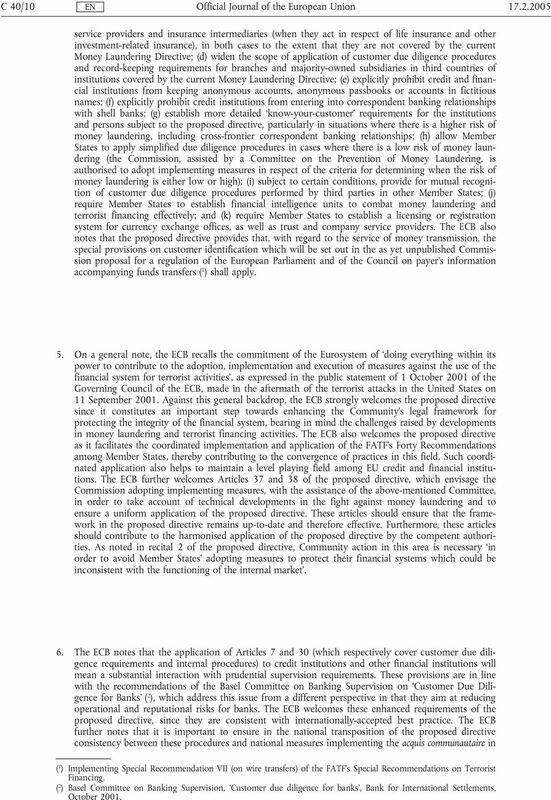 In particular, it is, inter alia, proposed to: (a) include terrorist financing within the concept of money laundering; (b) amend the definition of serious crime in the current directive on money laundering ( 1 ) (hereinafter the current Money Laundering Directive ); (c) extend the range of persons and institutions subject to the current Money Laundering Directive to cover, inter alia, trust and company ( 1 ) Directive 91/308/EEC of the Council of 10 June 1991 on prevention of the use of the financial system for the purpose of money laundering (OJ L 166, , p. 77). Directive as amended by Directive 2001/97/EC (OJ L 344, , p. 76). 2 C 40/ service providers and insurance intermediaries (when they act in respect of life insurance and other investment-related insurance), in both cases to the extent that they are not covered by the current Money Laundering Directive; (d) widen the scope of application of customer due diligence procedures and record-keeping requirements for branches and majority-owned subsidiaries in third countries of institutions covered by the current Money Laundering Directive; (e) explicitly prohibit credit and financial institutions from keeping anonymous accounts, anonymous passbooks or accounts in fictitious names; (f) explicitly prohibit credit institutions from entering into correspondent banking relationships with shell banks; (g) establish more detailed know-your-customer requirements for the institutions and persons subject to the proposed directive, particularly in situations where there is a higher risk of money laundering, including cross-frontier correspondent banking relationships; (h) allow Member States to apply simplified due diligence procedures in cases where there is a low risk of money laundering (the Commission, assisted by a Committee on the Prevention of Money Laundering, is authorised to adopt implementing measures in respect of the criteria for determining when the risk of money laundering is either low or high); (i) subject to certain conditions, provide for mutual recognition of customer due diligence procedures performed by third parties in other Member States; (j) require Member States to establish financial intelligence units to combat money laundering and terrorist financing effectively; and (k) require Member States to establish a licensing or registration system for currency exchange offices, as well as trust and company service providers. 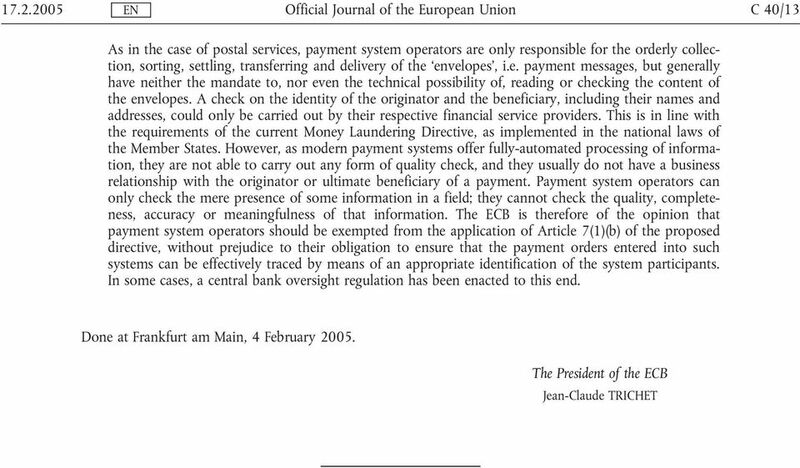 The ECB also notes that the proposed directive provides that, with regard to the service of money transmission, the special provisions on customer identification which will be set out in the as yet unpublished Commission proposal for a regulation of the European Parliament and of the Council on payer's information accompanying funds transfers ( 1 ) shall apply. 5. On a general note, the ECB recalls the commitment of the Eurosystem of doing everything within its power to contribute to the adoption, implementation and execution of measures against the use of the financial system for terrorist activities, as expressed in the public statement of 1 October 2001 of the Governing Council of the ECB, made in the aftermath of the terrorist attacks in the United States on 11 September Against this general backdrop, the ECB strongly welcomes the proposed directive since it constitutes an important step towards enhancing the Community's legal framework for protecting the integrity of the financial system, bearing in mind the challenges raised by developments in money laundering and terrorist financing activities. The ECB also welcomes the proposed directive as it facilitates the coordinated implementation and application of the FATF's Forty Recommendations among Member States, thereby contributing to the convergence of practices in this field. Such coordinated application also helps to maintain a level playing field among EU credit and financial institutions. The ECB further welcomes Articles 37 and 38 of the proposed directive, which envisage the Commission adopting implementing measures, with the assistance of the above-mentioned Committee, in order to take account of technical developments in the fight against money laundering and to ensure a uniform application of the proposed directive. These articles should ensure that the framework in the proposed directive remains up-to-date and therefore effective. Furthermore, these articles should contribute to the harmonised application of the proposed directive by the competent authorities. As noted in recital 2 of the proposed directive, Community action in this area is necessary in order to avoid Member States adopting measures to protect their financial systems which could be inconsistent with the functioning of the internal market'. 6. The ECB notes that the application of Articles 7 and 30 (which respectively cover customer due diligence requirements and internal procedures) to credit institutions and other financial institutions will mean a substantial interaction with prudential supervision requirements. These provisions are in line with the recommendations of the Basel Committee on Banking Supervision on Customer Due Diligence for Banks ( 2 ), which address this issue from a different perspective in that they aim at reducing operational and reputational risks for banks. The ECB welcomes these enhanced requirements of the proposed directive, since they are consistent with internationally-accepted best practice. The ECB further notes that it is important to ensure in the national transposition of the proposed directive consistency between these procedures and national measures implementing the acquis communautaire in ( 1 ) Implementing Special Recommendation VII (on wire transfers) of the FATF's Special Recommendations on Terrorist Financing. ( 2 ) Basel Committee on Banking Supervision, 'Customer due diligence for banks', Bank for International Settlements, October 2001. 3 C 40/11 the area of prudential supervision of credit institutions and other financial institutions, notably with regard to the supervision of banking and financial groups. To this end, a consistent and coordinated application of customer due diligence requirements by the competent authorities should be sought and will be of particular relevance in legislation where the enforcement of compliance with customer due diligence standards is entrusted to authorities other than the prudential supervisor for banks. Consistency and coordination should also lessen the regulatory compliance burden at a cross-border level. In particular, the ECB observes that compliance with customer due diligence requirements is also linked to operational risk, which is addressed in the proposal for the recasting of the Consolidated Banking Directive and the Capital Adequacy Directive ( 1 ). This link stems from the fact that loss directly ( 2 ) resulting from inadequate customer due diligence falls within the scope of operational risk, defined in Article 4 of the proposed recast Consolidated Banking Directive to include the risk of loss resulting from inadequate or failed internal processes, people and systems. Therefore the management of operational risk, as required in Annex V, point 11 of the proposed recast Consolidated Banking Directive also encompasses the policies and procedures required under Articles 7 and 30 of the proposed directive. More generally, pursuant to Article 22 of the proposed recast Consolidated Banking Directive, requirements must be imposed on banks to have processes to manage all material actual or future risks, which would include reputational risk resulting from inadequate customer due diligence. The ECB submits that this interaction should be explicitly addressed in Articles 7 and 30 of the proposed directive. As a minimum, the implementation of all related provisions and the subsequent supervision by the competent authorities must be consistent to avoid any undue burden on affected institutions. 7. The ECB notes that Article 11(1) of the proposed directive sets out enhanced customer due diligence requirements in respect of, inter alia, cross-frontier correspondent banking relationships with credit institutions from other Member States or third countries. This provision seeks to implement Recommendation 7 of the FATF's Forty Recommendations, which covers cross-frontier correspondent banking relationships. As noted in the explanatory memorandum to the proposed directive, cross-frontier banking relationships are an area where the risk of money laundering and terrorist financing is particularly high, and as such they require particular care. 8. The ECB also notes that the enhanced customer due diligence requirements applicable to cross-frontier correspondent banking relationships do not apply to correspondent banking relationships between two credit institutions in the same Member State. However, the wording of Article 11(1) of the proposed directive does not appear to have taken into account the specific EU system of mutual recognition, as set out in the Consolidated Banking Directive ( 3 ). 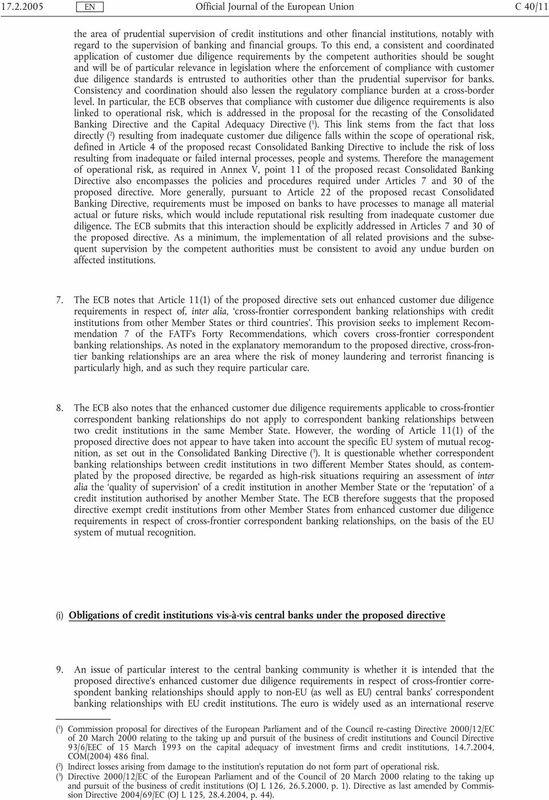 It is questionable whether correspondent banking relationships between credit institutions in two different Member States should, as contemplated by the proposed directive, be regarded as high-risk situations requiring an assessment of inter alia the quality of supervision of a credit institution in another Member State or the reputation of a credit institution authorised by another Member State. The ECB therefore suggests that the proposed directive exempt credit institutions from other Member States from enhanced customer due diligence requirements in respect of cross-frontier correspondent banking relationships, on the basis of the EU system of mutual recognition. (i) Obligations of credit institutions vis-à-vis central banks under the proposed directive 9. An issue of particular interest to the central banking community is whether it is intended that the proposed directive's enhanced customer due diligence requirements in respect of cross-frontier correspondent banking relationships should apply to non-eu (as well as EU) central banks' correspondent banking relationships with EU credit institutions. The euro is widely used as an international reserve ( 1 ) Commission proposal for directives of the European Parliament and of the Council re-casting Directive 2000/12/EC of 20 March 2000 relating to the taking up and pursuit of the business of credit institutions and Council Directive 93/6/EEC of 15 March 1993 on the capital adequacy of investment firms and credit institutions, , COM(2004) 486 final. ( 2 ) Indirect losses arising from damage to the institution's reputation do not form part of operational risk. ( 3 ) Directive 2000/12/EC of the European Parliament and of the Council of 20 March 2000 relating to the taking up and pursuit of the business of credit institutions (OJ L 126, , p. 1). Directive as last amended by Commission Directive 2004/69/EC (OJ L 125, , p. 44). 4 C 40/ currency, and consequently many non-eu central banks and monetary authorities have correspondent banking relationships with EU credit institutions. In the United States, the provisions of the USA PATRIOT Act ( 1 ) that require certification in connection with correspondent accounts administered, established or maintained on behalf of foreign banks do not apply to any foreign central bank or monetary authority that functions as a central bank, or any international financial institution or regional development bank formed by treaty or international agreement. 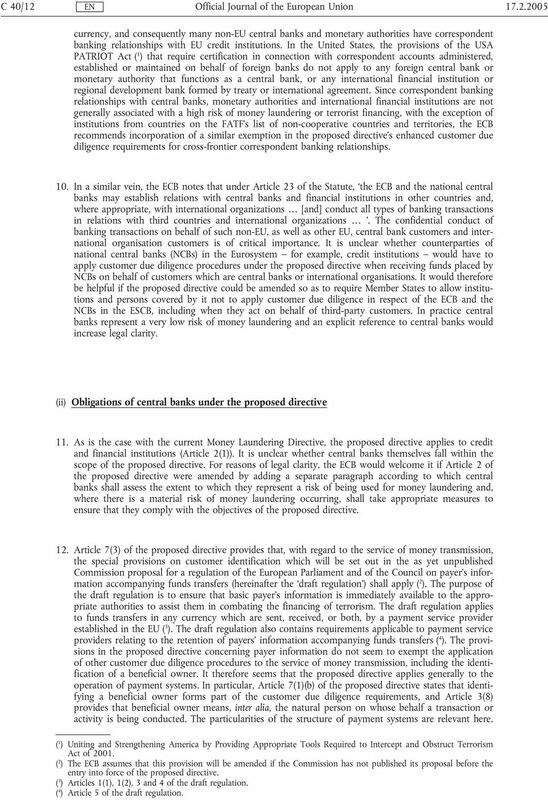 Since correspondent banking relationships with central banks, monetary authorities and international financial institutions are not generally associated with a high risk of money laundering or terrorist financing, with the exception of institutions from countries on the FATF's list of non-cooperative countries and territories, the ECB recommends incorporation of a similar exemption in the proposed directive's enhanced customer due diligence requirements for cross-frontier correspondent banking relationships. 10. In a similar vein, the ECB notes that under Article 23 of the Statute, the ECB and the national central banks may establish relations with central banks and financial institutions in other countries and, where appropriate, with international organizations [and] conduct all types of banking transactions in relations with third countries and international organizations. The confidential conduct of banking transactions on behalf of such non-eu, as well as other EU, central bank customers and international organisation customers is of critical importance. It is unclear whether counterparties of national central banks (NCBs) in the Eurosystem for example, credit institutions would have to apply customer due diligence procedures under the proposed directive when receiving funds placed by NCBs on behalf of customers which are central banks or international organisations. It would therefore be helpful if the proposed directive could be amended so as to require Member States to allow institutions and persons covered by it not to apply customer due diligence in respect of the ECB and the NCBs in the ESCB, including when they act on behalf of third-party customers. In practice central banks represent a very low risk of money laundering and an explicit reference to central banks would increase legal clarity. (ii) Obligations of central banks under the proposed directive 11. As is the case with the current Money Laundering Directive, the proposed directive applies to credit and financial institutions (Article 2(1)). It is unclear whether central banks themselves fall within the scope of the proposed directive. For reasons of legal clarity, the ECB would welcome it if Article 2 of the proposed directive were amended by adding a separate paragraph according to which central banks shall assess the extent to which they represent a risk of being used for money laundering and, where there is a material risk of money laundering occurring, shall take appropriate measures to ensure that they comply with the objectives of the proposed directive. 12. Article 7(3) of the proposed directive provides that, with regard to the service of money transmission, the special provisions on customer identification which will be set out in the as yet unpublished Commission proposal for a regulation of the European Parliament and of the Council on payer's information accompanying funds transfers (hereinafter the draft regulation ) shall apply ( 2 ). The purpose of the draft regulation is to ensure that basic payer's information is immediately available to the appropriate authorities to assist them in combating the financing of terrorism. The draft regulation applies to funds transfers in any currency which are sent, received, or both, by a payment service provider established in the EU ( 3 ). The draft regulation also contains requirements applicable to payment service providers relating to the retention of payers' information accompanying funds transfers ( 4 ). The provisions in the proposed directive concerning payer information do not seem to exempt the application of other customer due diligence procedures to the service of money transmission, including the identification of a beneficial owner. It therefore seems that the proposed directive applies generally to the operation of payment systems. In particular, Article 7(1)(b) of the proposed directive states that identifying a beneficial owner forms part of the customer due diligence requirements, and Article 3(8) provides that beneficial owner means, inter alia, the natural person on whose behalf a transaction or activity is being conducted. The particularities of the structure of payment systems are relevant here. ( 1 ) Uniting and Strengthening America by Providing Appropriate Tools Required to Intercept and Obstruct Terrorism Act of ( 2 ) The ECB assumes that this provision will be amended if the Commission has not published its proposal before the entry into force of the proposed directive. ( 3 ) Articles 1(1), 1(2), 3 and 4 of the draft regulation. ( 4 ) Article 5 of the draft regulation. UNITED NATIONS A Page 1 Distr. GENERAL 21 February 1997 Fifty-first session Agenda item 12 RESOLUTION ADOPTED BY THE GENERAL ASSEMBLY [on the report of the Second Committee (A/51/601)] 97-76873 /... 51/191.